I posted a picture the other day on instagram of the two Neutrogena products that I had just purchased at Target. I am here to give you a review of the first one I tried. 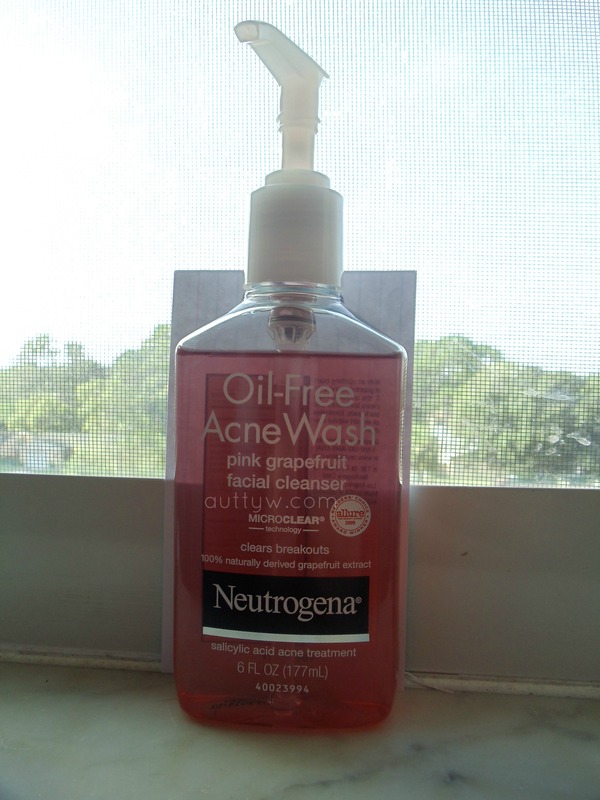 The Neutrogena Oil-Free Acne Wash in pink grapefruit is what this review is going to be all about. 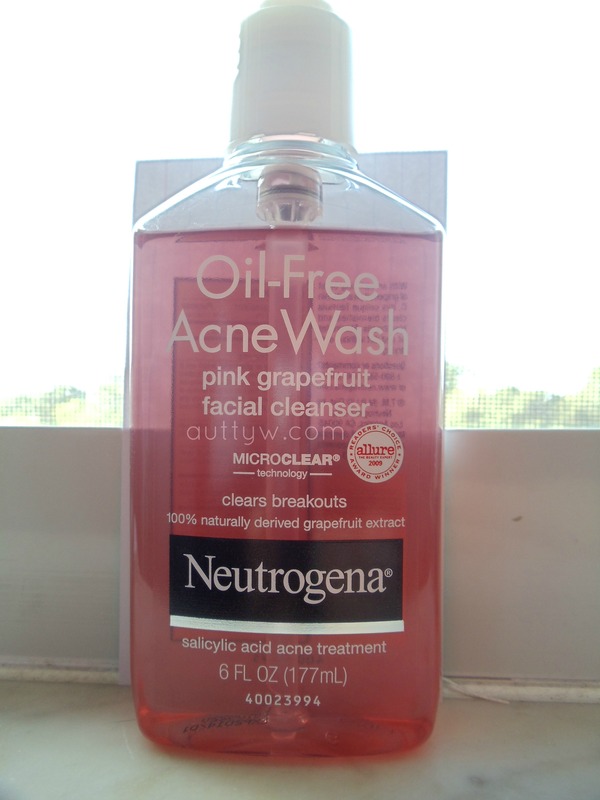 Now this is my first Neutrogena face wash that I have ever tried. I didn't have high expectations, but I had some. Well, really I wanted it to be amazing, is that a lot to ask for? Haha. Well, honestly, this fell kind of flat for me. There is a scent of grapefruit, but as you rub it in, it gets an old granny kind of smell. Actually a nursing home smell is what it reminds me of, it also reminds me of the Method Pink Grapfruit dish detergent. That is the first thing I picked up, so the scent is not doing it for me. I feel like I am putting something that you should be washing your dishes with on your face. D: You will see a trend with my skincare products. 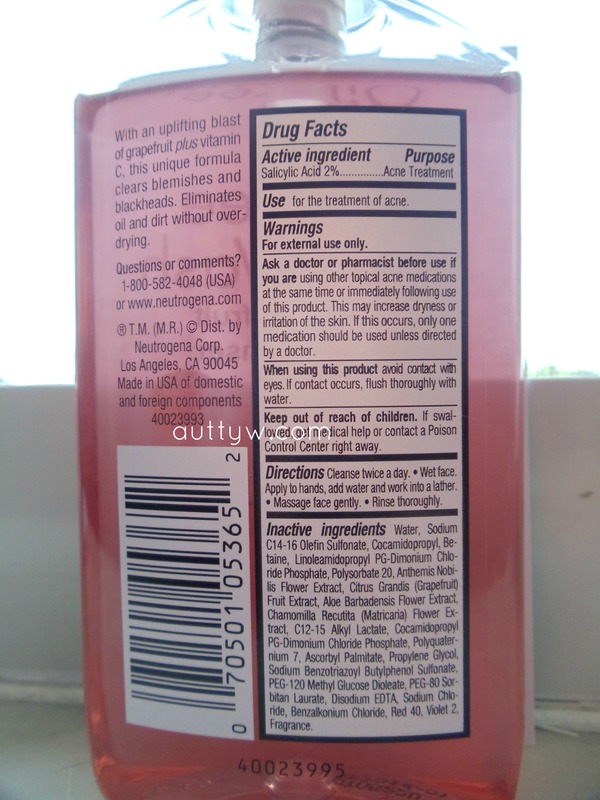 So there is no surprise that this has 2% salicylic acid in it, which is used for the treatment of acne. The consistency of this is a gel cleanser, and it has a pump on the top. I really prefer those kinds of dispenser. I always use less when there is a pump. I paid around $8 for this at Target it is 6 FL OZ (177mL). This face wash is one of their more expensive ones, maybe because of the grapefruit aspect. I have no idea. Other than the old granny nursing home scent, I kind of don't like this face wash at all. It looks like I've barely used it, but after a week, I Just can't stand it anymore! The only breakouts it has give me, is this one huge pimple that just doesn't want to go away, but I am dealing with it on its own. Other than that, my only complaint is that it made me even more oily! It wound up drying my skin out, mainly in my cheeks, I barely get oily on my cheeks, but oh my goodness. Chris even noticed that my face was oilier than normal and when he notices something you know its time to just give it up! It didn't agitated my skin or anything like that, I've heard those claims about this product, but it just made my skin product more sebum (oil). Its not a good look at all! When I say it dried my cheeks out, I really mean it. They felt dry, and the skin was VERY tight. It was so weird, I've never had that happen from a face wash before! Thank goodness for a moisturizer, but even using one to balance out my skin again, I still got really oily, and really quick at that. About 10 minutes after I washed my face I was a grease-ball. I jumped in the pool yesterday and felt my face and all you could feel was oil. It felt like I stuck my face in cooking oil, it was that bad. There really are no redeeming qualities about this product for me. I love the smell of grapefruit, but its an old granny/nursing home/dish soap kind of smell and its very strong. Its actually sickeningly strong at first. I really really do want to like this product, but I just can't deal with my face being/feeling so oily. You can purchase this anywhere that you can get Neutrogena including Ulta. Do I recommend this? No, its really hard for me to recommend something that just was not good for me. Other people love it however because it has an Allure Editors Choice Award from 2009. So, you can try it if you would like, but in my own personal opinion, stay away. Disclaimer; The above products were purchased by me with my own money. I am not affiliated with any of the companies stated above. I am not being paid or sponsored to do this review. All opinions are 100% my own.